Hazardous: No, this material's shipping specifications are not classified as hazardous. Spurred by the promise of SiC nanowires' mechanical properties, M. Wieligor et al. used Nanomor silicon carbide nanoparticles to develop two novel manufacturing protocols for the synthesis of silicon carbide nanowires . These SiC nanowire synthesis methods are based directly on SiC nanopowders and thus do not require catalysts or very high temperatures, providing a significant advantage over other methods such as carbothermal reduction (Si and CNTs), chemical vapor deposition, SiCl3 and CCl4 reactions, and so on. Roughly speaking, the authors' experimental method involved dispersion by ultrasonication in ethyl alcohol, sintering, heat treatment in air and KOH, and ultimately rinsing with alcohol and distilled water. Final results indicated that between the bulk crystal form and nanopowder form of SiC, there are no significant changes in Raman spectra dependencies with respect to temperature or pressure, but that once SiC nanowires are formed, differences do begin to appear. XRD was used to monitor the synthesis of the SiC nanowires during the process, and TEM images indicated that different nanowire diameters (20 nm and 200 nm) can be achieved as a function of sintering conditions. 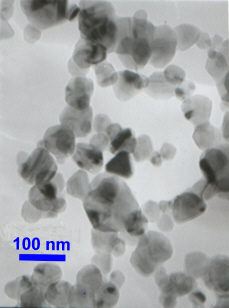 Nanomor silicon carbide nanoparticles were also used by W.L.E. Wong and M. Gupta, in their study of silicon carbide reinforcement of magnesium . Such composites are of interest because magnesium has lower density than even aluminum, providing a lightness that can be combined with exceptional strength and toughness if the appropriate type of nanoparticle reinforcement is chosen when designing a composite. The authors were the first to study the effect that different SiC length scales - i.e., different particle sizes - have on such a composite, looking at various mixtures of microscale and nanoscale SiC reinforcement particles. W.L.E. Wong and M. Gupta first used mechanical alloying to mix the magnesium and silicon carbide, followed by compacting, sintering and hot extruding. Testing (by thermomechanical analysis, microstructural characterization, X-Ray diffraction and Vickers microhardness) found that the nanoscale-based composites gave the best strength and ductility, and that a mixture of both microscale and nanoscale SiC will give the greatest overall microhardness. M. Wieligor et al., "Raman spectra of silicon carbide small particles and nanowires", J. Phys. : Condens. Matter, 2005, vol. 17, pp. 2387-2395. W.L.E. Wong and M. Gupta, "Effect of hybrid length scales (micro + nano) of SiC reinforcement on the properties of magnesium", Solid State Phenomena, 2006, vol. 111, pp. 91-94.